Looking for something to shake up your dinner plans? Try these low FODMAP enchiladas. Filled with seasoned meat and smothered in a savory red sauce, these enchiladas will be the talk of your dinner table. Since I posted my low FODMAP taco seasoning, my husband has become a little obsessed. So much so, we’ve had to put a temporary moratorium on tacos in our house. While this was a welcome break for my taste buds, it left an opening in our meal rotation. I did some experimenting and these low FODMAP enchiladas are the perfect replacement. Easy to make and jam-packed with flavour, these enchiladas will be a new family favourite in no time. Think these low FODMAP enchiladas sound great, but you don’t have time to try them now? Don’t worry. You can PIN THIS POST for later. These low FODMAP enchiladas will be a regular at your dinner table. Check out the notes below for tips on keeping this recipe FODMAP friendly. First, this recipe uses tomato paste and low fodmap salsa. Since certain tomatoes can be high in fructans, you need to make sure you use the right kind. According to the Monash app, tomato paste is safe in servings of 2 tbsp. Our recipe uses two 6 oz cans of tomato paste, which works out to two tbsp per serving. This is within the recommended serving size. You’ll also need a low FODMAP salsa. You can either use my low FODMAP salsa recipe or buy a low FODMAP salsa from a company like Fody Food Co.
My recipe normally uses Roma tomatoes. But, since we’re also using tomato paste, I recommend swapping them for common tomatoes. Common tomatoes don’t have any FODMAPs, so they won’t add to your FODMAP load. As a side note, even though our tomato ingredients are low FODMAP, they will be acidic. If you suffer from issues like GERD, Dyspepsia, or general acid reflux, this recipe may not be right for you. Next up is your wrap. If you’re in the elimination phase, you can either use a gluten-free tortilla or a corn tortilla. Remember, unless you have celiac disease, you’re avoiding the FODMAP fructan, not the gluten itself. Last but not least is cheese. Hard cheeses like cheddar are low FODMAP in small portions because the lactose is broken down by bacteria during the fermentation process. According to Monash University, 3/8 of a cup of shredded cheddar is low FODMAP. This recipe uses 1 tbsp of cheddar in each enchilada, as well as 1 cup of cheese on top. This works out to roughly 2.5 tbsp of cheddar cheese per enchilada (about 1/4 cup). This is within the recommended range. If you have leftover salsa, toss it in with some rice for a deliciously seasoned side. You can also pair these savoury enchiladas with a fresh garden salad to add a pop of colour to your meal. 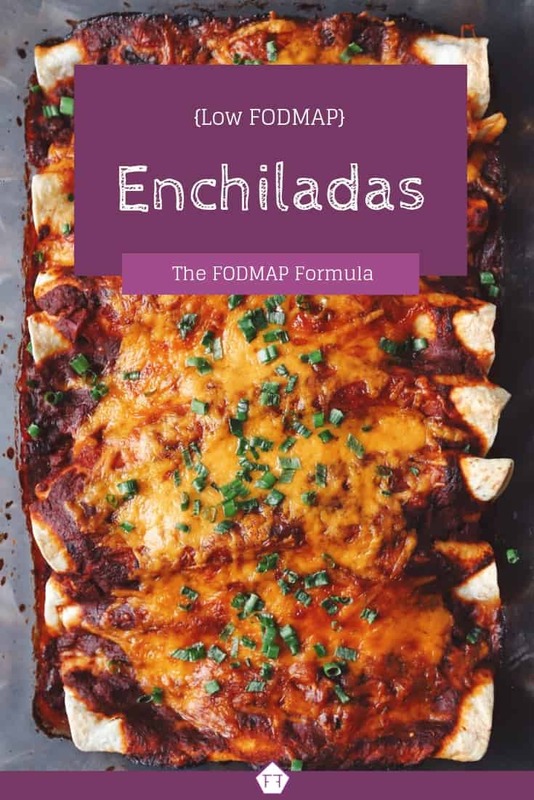 Want to try these low FODMAP enchiladas? Don’t forget to PIN THIS RECIPE for later. Shake up your dinner routine with these low FODMAP enchiladas! Packed with flavour, these enchiladas are an easy way to spice things up at the dinner table. Heat your garlic infused oil in a saucepan over medium heat, then add your spices (chili powder through salt). Give them a swirl to turn the oil into a paste, then quickly add your low FODMAP salsa and tomato paste. Stir the ingredients together, then add your water. Simmer, uncovered, for 15-20 minutes. Heat oil in a frying pan over medium heat. Add ground beef and spices (salt through cayenne pepper) and cook until browned. Place a few spoonfuls of enchilada sauce in the bottom of the 13 x 9" baking dish. Spread the sauce lightly over the bottom of the pan to prevent the enchiladas from sticking. Place a spoonful of enchilada sauce down the center of a tortilla, followed by a spoonful of ground beef, and 1 tbsp of shredded cheddar cheese. Wrap up the enchilada like a taco and place it in the baking dish, edges down. Repeat for each tortilla. Spread remaining enchilada sauce over the enchiladas and top with cheese. Bake for 20-25 minutes (until cheese begins to bubble). Top with optional green onions. Serve warm. To save time, you can make your enchilada sauce the night before. These low FODMAP enchiladas will shake up your next taco night. If you like this recipe, don’t forget to sign up for my mailing list below. You’ll get new recipes and articles delivered right to your inbox. Want more FODMAP friendly recipes? Follow me on Pinterest for more low FODMAP meal ideas. Together we’ll get the Low FODMAP Diet down to a science. Hello there! 🙂 I’m excited to see some new recipes out for FODMAPS! I have been creating meals for over a year now for my hubby. He seems to have issues with (tomatoes)…any ideas on what to try? Maybe a green sauce? I’ve narrowed it down to garlic, onion, tomatoes, lactose, & med-lg portions of wheat that bother him. So challenging, I would love to try your enchiladas & BBQ recipes…but, I’m scared. Unfortunately, I don’t have any tips for modifying this recipe (or my BBQ sauce) at present. Is the issue with reflux or is it gastrointestinal? That would change the approach significantly. Let me know and I’ll ask around for some anti-tomato alternatives for you. Amazing recipe!!! I know it’s tough to do, but any thoughts on a vegetarian protein in this? I love mixing in meatless recipes on occasion, and would love to try something. I did some Googling and it seems like most vegetarian enchiladas are made with black beans. Black beans are high in the FODMAP GOS (galacto-oligosaccharides), so they’re not appropriate for the elimination phase of the program. Once you’ve completed your re-challenge, if you’re ok with beans, you can try replacing the meat with fried black beans. Canned black beans are your best bet. Since FODMAPs are water soluble, some of the FODMAP molecules will leach into the water. Make sure you rinse them thoroughly and chop them up as finely as possible so they have the same texture. If you try it, don’t forget to come back and let me know how it turned out! Very good! Been trying to find new recipes that are FODMAP friendly that my husband will like as well. This passed the test! It did make a lot of sauce and even with using 94% ground beef it was hard to have enough to fill each shell. I would make 1.5 lbs beef in the future and plan on not using all the sauce. I ended up making a couple of enchiladas with FODMAP-friendly refried beans to get enough. We’re normally pretty sparing when it comes to putting sauce inside our enchiladas, so the sauce may go a little farther at our table. Thanks for letting me know about your adjustments, though! It helps to know how recipes workout when others try them.